Universal car holder with magnet holder and two metal plates. Thanks to the magnetic clip you can attach it anywhere, in particular to the air vent of your car. 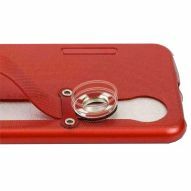 The support is universal and is suitable for any kind of smartphone just to the characteristic of the magnetic attachment. It is able to perform a rotation of 360° to allow you to keep your smartphone in the most comfortable position, horizontally and vertically. Comfortable and easy to install to the air vent of your car, while driving you can answer your phone or use GPS in a safer and simpler way.